If you are looking for an emergency plumber in Liverpool, then look no further. Our qualified plumbers and central heating engineers respond to all kinds plumbing emergencies. If you have a water leak that you can’t contain, then we’d advise turning off your water supply. If it’s a leaking shower or toilet cistern, then there should be a shut-off valve on the water pipe leading to it. It may be a tap that you can turn with your hand, or it could have a screw-slot that you’ll need a common screwdriver (flat head) to turn. 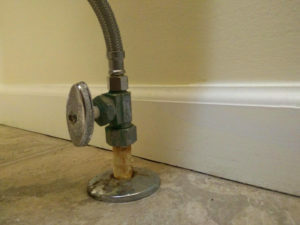 If there isn’t an emergency shut-off valve, you can shut off the water supply to your whole home by locating the stop tap. The stop tap is usually located out the front of your house in the street. There will be a small metal grate. You should be able to get your finger in the grate and pull it open, otherwise you can get a screwdriver under the edge to lift it up. Once you’ve lifted the grate, you should be able to see the tap. Just turn it with your hand to turn it off like you would any other tap. See the video below which shows how to locate and shut off your stop tap. What types of emergencies can you fix? We can help with any plumbing emergency that is not a danger to life. If you have an emergency that poses a risk to you, or someone else’s safety, you should get to safety and call the emergency services. If you’re unsure of the best course of action regarding your plumbing emergency, just pick up the phone and give us a call, we’re always happy to advise. In 99% of cases, we are able to fix problems on the spot with tools and equipment we have in the van. If for what ever reason we can’t fully fix the problem, we will do what we can to limit further issues and return the following day to fully resolve. Yes, call us any time and we’ll do what we can to help. We are a 24 hour plumber, so our emergency plumbers are available 24/7, all year round. How long will you take to arrive? We will typically arrive to emergency call-outs within the hour. If we are unable to reach you in this time, we will let you know in advance and provide advice to help limit the damage until we arrive. Is there an emergency call-out charge? Our charges can vary depending on the severity of the job, the time of day and whether it’s a weekend. We are open and honest about our costs and will give you an accurate idea of how much we will need to charge when receive your call. If there are any further costs, such as replacement parts, we will tell you ahead of time so that you can make an informed decision. What areas do you cover for emergency call-outs? If you live outside of these areas, please call us anyway, as we may be able to help you anyway, we have a network of local plumbers so we can usually send one of our partners to emergency jobs.